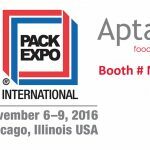 Aptar’s bonded aluminum to plastic (BAP®) technology will be among a wide range of dispensing technologies that will be showcased by Aptar at PACK EXPO International 2016 (Nov. 6-9; McCormick Place, Chicago, IL). BAP® is a versatile technology that helps brands become innovators in their categories, making them stand out against competition and gain market share. The superior sealing integrity provides customers and consumers with safety at all levels. BAP® can address a variety of e-commerce challenges such as leaking packages, labor and material costs associated with tertiary packaging, among others. The easy-to-open feature delivers convenience to all age groups while providing a unique experience every time consumers open a new package. BAP® will be highlighted at the Innovation Stage on Sunday at 1pm (Booth#4570), where Aptar will provide attendees with great insight into megatrends driving the food and beverage packaging industry. Visit us at Booth# N-6378 to learn more about this exciting technology as well as all Aptar offerings! Visit our website for more information or contact us with any questions you have.